A doctoral student at Rensselaer Polytechnic Institute (RPI) has won the 2011 Lemelson-MIT Student Prize for developing a new technique for detecting hidden explosives, chemicals, and other dangerous materials from a safe distance. 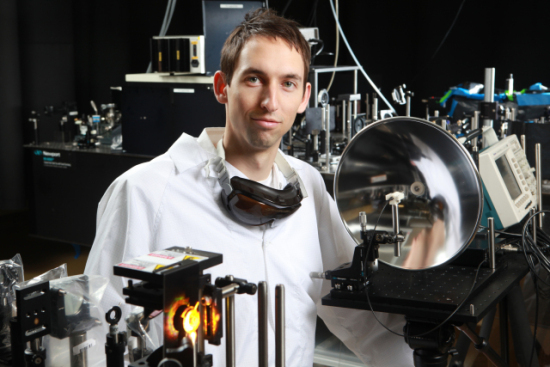 Benjamin Clough, a student in the department of Electrical Computer, and Systems Engineering at RPI, found a way to use sound waves to increase the effective distance of terahertz spectroscopy from a few feet to several meters, so that first responders, police, military personnel, chemical plant employees and others can detect unsafe materials from a safer distance. Clough's work incorporated a sensitive microphone that can detect terahertz from the acoustic waves emitted by the materials. The audio information can be converted to digital data and be instantly checked against a library of known terahertz fingerprints to determine the chemical composition of the material. The Lemelson-MIT Program celebrates outstanding innovators and inspires young people to pursue creative lives and careers through invention. Clough wins $30,000 for his patent pending invention. Got 2 be hired already by DoD, ATF, US Police Depts Assoc.